Right now the Oregon economy continues to improve and is even a bit above our office’s forecast. As we continue to work on the next outlook, it can be useful to look back and compare business cycles to see what, if anything, we can learn from past experiences. 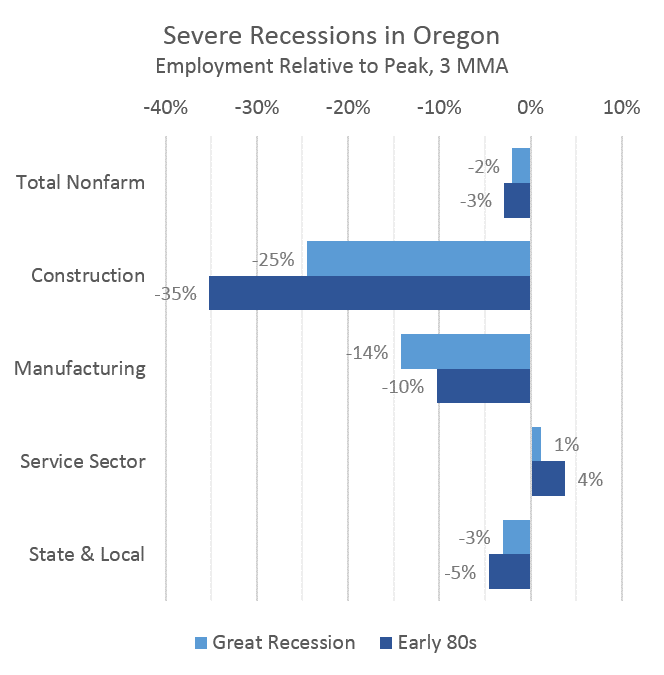 Oregon has had two severe recessions since World War II, the early 1980s when the timber industry restructured and the Great Recession. In terms of employment, today the state largely tracks the experience seen during the 1980s, and also in terms of unemployment, as shown below (more on historical U-6). Can we expect this acceleration to last or even pick up further? Well, a lot of the stronger growth today can be tied to construction and housing more broadly, which may not continue to grow at current rates of growth for much longer. Likewise, it is unusual to see such acceleration in the middle of a business cycle. Historically, the acceleration occurred right at the beginning of an expansion as the goods producing industries experienced a cyclical boost due to pent-up demand as the Federal Reserve lowered interest rates. The Great Recession is a financial crisis and completely different as the Fed was cutting interest rates going into it. However, expectations were for at least some acceleration during the recovery as the major weights of housing and government lifted and household balance sheets were slowly repaired. Additionally, one of the defining features of the past 3 business cycles is the so-called jobless recoveries where the economy did not get that cyclical rebound coming out of the gate. However, it can be important to step back and actually look at some numbers here and not just our stylized facts or memory. 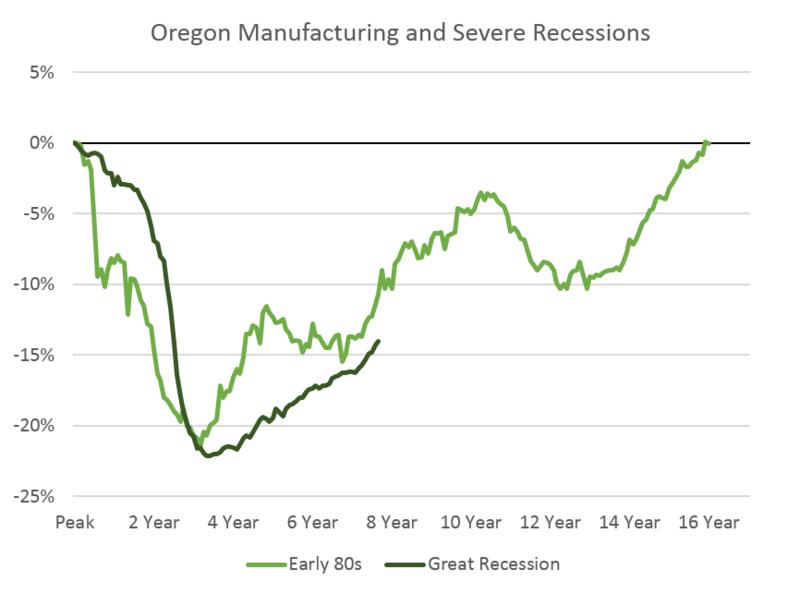 In Oregon, coming out of the early 80s recession it took 16 years to fully regain all of the manufacturing losses. Yes, the timber industry restructuring played a large role and the high-tech industry was just beginning to ramp up in sheer numbers. 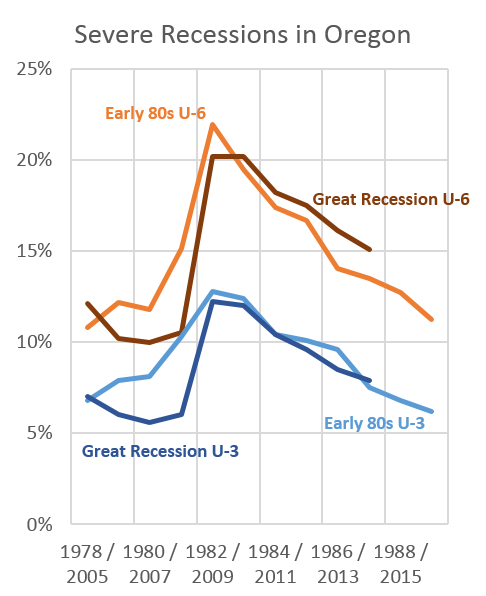 However, the Great Recession today is largely in the same relative place as back in mid-80s. Oregon’s manufacturers are adding jobs, but it has been a slow process following a massive recession. Even looking at industry level comparisons like this, Oregon today is quite similar to the state back in the 1980s. In many ways it is easy to say that the Great Recession is different. However, just as Reinhart and Rogoff titled their book “This Time is Different” with tongue firmly planted in cheek, Oregon too has precedent when it comes to severe recessions. What is unusual, however, is this acceleration mid-expansion that Oregon is seeing. In conversation with some of our advisors (two more meetings this week) and the consensus of economists and forecasters nationally, expectations are for this stronger growth to continue for awhile longer before the longer-run demographics weigh on growth rates over the extended horizon. This is good news for the economic outlook and Oregonians as more job opportunities become available and wages begin to rise as well. Things are looking up and Oregon is getting there. Exactly how this translates into our updated economic and revenue outlook is still a work in progress, with our next quarterly release scheduled for May 28th. Lastly, comparing detailed historical data based on the Standard Industrial Classification with current data based on the North American Industry Classification System can be challenging due to revisions and reclassification. However, comparisons at a broad level are still useful. Data below compare where Oregon is today (data through March, 2014) with where we were back in the mid 1980s.